HUG United (tm) - USA BY DESIGNERS: Selection! Alejandro Ovalles (Venezuela), Alex Chavot and Monika Krukierek (France), Andre Sanchez (France), Anne-Charlotte Coudreau (France), Bruno Rivera (Bolivia), Carolina Torres (Argentina), Chelsea Jones (Australia), David Criado (Bolivia), Dirk Schaechter (Germany), Emelei Ivansson (Sweden), Eureka Agency (Colombia), Franck Valayer aka TONKY (France), Gatis Zebergs (Latvia), Giulio Iurissevich (Italy), Ivan Apostolski (Serbia), Jean-Joseph Renucci (France), Marko Milin (Serbia), Mathew Prada (Bolivia), Michal Dabrowski (Poland), Pete Rossi (UK), Sergio Alves (Portugal), Sophie Masure aka Fonfek (France), Sylvain Bousseton aka Sinke (France), Thibault Jorge (France), Valentina Brostean (Serbia) and Yanaki (France). 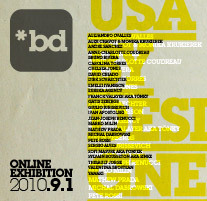 Selected works will be presented soon in an online exhibition. We would like to thank the whole contributors for their works, the jury for is implication and the media supporters!